JE- Age Between 18 to 45 Years. Foreman/Jr. Chemist/Jr. Superintendent- Age between 18 to 28 Years. Technician/Assistant- Age Between 18 to 26 Years. Education Qualification : Junior Engineer- Passed Diploma in Concerned Engineering Branch with minimum 55% marks for ST Candidate and 8 year Work Experience in Similar Field. Foreman- Passed Diploma in Concerned Engineering Branch with minimum 60% Marks and 2 year Work Experience in Similar Field. Junior Chemist- Passed M.Sc Degree in Chemistry with minimum 55% Marks and 2 Year Work Experience in Similar Field. JS Official Language- Passed Graduation in Hindi Literature with minimum 55% Marks and 3 Year Work Experience in Similar Field. JS HR- Passed Graduation with minimum 55% Marks and Diploma in Personal Mgmt./Industrial Relation with 55% Marks and 2 Year Work Experience in Similar Field. Technician- Passed Matric and ITI Certificate in Concerned Trade and 2 Year Work Experience in Similar Field. Assistant HR/Store & Purchase- Passed Graduation with minimum 55% Marks and 1 Year Work Experience in Similar Field. Accounts Assistant- Passed B.Com Degree with minimum 55% Marks and 1 Year Work Experience in Similar Field. Marketing Assistant- Passed Graduation in Business Administration(BBA/BBS/BBM) with minimum 55% Marks and 1 Year Work Experience in Similar Field. 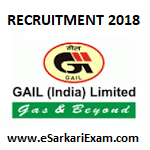 Eligible Candidates can Submit Application at the Official Website of GAIL latest by 30th November 2018. Applicants First Logon to GAIL Official Website. Click on Applying to GAIL Link in Career Section at Home Page. Open Detailed Advertisement Link in Non Executive Cadre. Upload Scan Photograph and Signature and Required Documents.